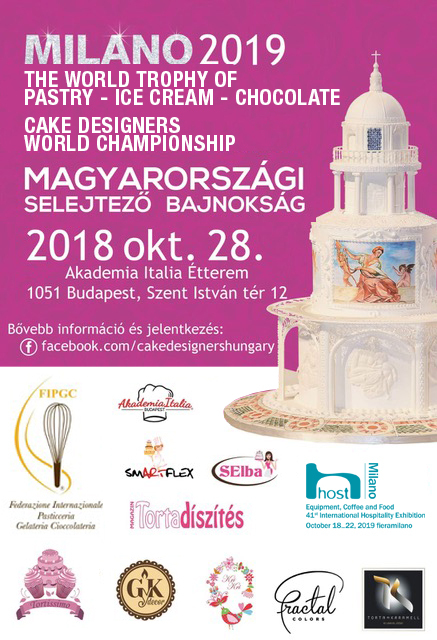 The selections for “The World Trophy of Pastry Ice Cream and Chocolate FIPGC” and “Cake Designers World Championship FIPGC” will be held on October 28, 2018 in Budapest at Academia Italia, which will decree the two Hungarian nationals who will participate in the world championships which will take place from 18 to 22 October 2019 at Host Fiera Milano. Numerous participants are enrolled in the selections. They will have to compete in artistic and tasting tests, concerning chocolate, isomalt, pastillage, cakes, ice cream and cake design. Kristina Rado will be president of the jury in the German selection of cake design, while Angelo Gala will be president of the jury for the selection of pastry.